I thought this infinity scarf would be done in January, but I don’t think I’m going to make it. So close. I can’t believe it is almost February. This entry was posted in Crafting, Knitting and tagged Berroco, circular knitting, Flickr, Scarf. Bookmark the permalink. You have been knitting up a storm recently! 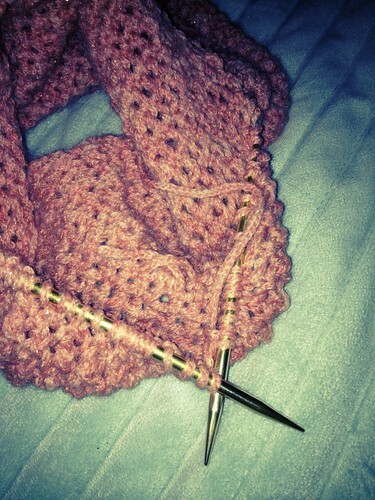 This scarf is super pretty, can’t wait to see it off the needles. Thanks! Me too. I think I have one or two more balls of yarn to go so it might be a while.